At Nudge, we are committed to maintaining the trust and confidence of our visitors to our website and subscribers to our newsletter. Here you’ll find information on how we treat data that we collect from visitors to our website, or when someone subscribes to our newsletter. When someone visits www.nudgepr.co.uk we use a third party service, Google Analytics, to collect standard internet log information and details of visitor behaviour patterns. We do this to find out things such as the number of visitors to the various parts of the site. This information is only processed in a way which does not identify anyone. We do not make, and do not allow Google to make, any attempt to find out the identities of those visiting our website. You can find more information on how cookies are used on this website in the Cookies Policy below. As part of the registration process for our monthly e-newsletter, we collect personal information. We use that information for a couple of reasons: to tell you about stuff you have asked us to tell you about or we feel is of legitimate interest; to contact you if we need to obtain or provide additional information; to check our records are right and to check every now and then that you’re happy and satisfied. We don't rent or trade email lists with other organisations and businesses. We use a third party provider, Campaign Monitor, to deliver our newsletter. We gather statistics around email opening and clicks using industry standard technologies to help us monitor and improve our e-newsletter. For more information, please see Campaign Monitor’s privacy notice. You can unsubscribe to general mailings at any time of the day or night by clicking the unsubscribe link at the bottom of any of our emails or by emailing phoebe@nudgepr.co.uk. You are entitled to access the personal information that we hold. Email your request to phoebe@nudgepr.co.uk. We keep our privacy notice under regular review. This privacy notice was last updated on 15 th May 2018. What is a cookie? Cookies are text files containing small amounts of information which are downloaded to your personal computer, mobile or other device when you visit a website. Cookies are then sent back to the originating website on each subsequent visit, or to another website that recognises that cookie. Cookies are useful because they allow a website to recognise a user's device. Cookies do lots of different jobs, like letting you navigate between pages efficiently, remembering your preferences, and generally improve the user experience. They help keep us and you secure and help reduce spam. These cookies allow third parties to track the success of their application or customise the application for you. Because of how cookies work we cannot access these cookies, nor can the third parties access the data in cookies used on our site. For example, if you choose to ‘share’ content through Twitter or other social networks you might be sent cookies from these websites. We don't control the setting of these cookies, so please check those websites for more information about their cookies and how to manage them. Preheat oven to 190C. Line cookie sheets with parchment. In a small bowl, combine flour and baking powder. Set aside. In a large bowl, cream butter, sugars and salt until light. Beat in eggs and vanilla until smooth. Mix in flour just until combined; stir in chips. 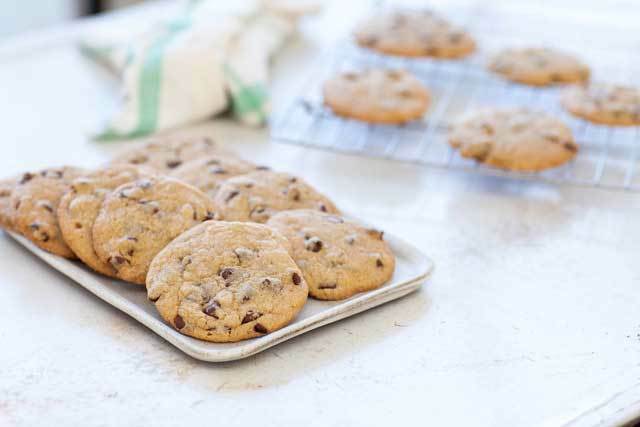 Drop by well-rounded teaspoonfuls onto lined cookie sheets, allowing 2 inches between cookies. Bake 10-12 minutes or until golden brown around edges. Cool on baking sheet several minutes before transferring to racks to cook completely. Store in airtight container.